On III, Walter Smith III’s Criss Cross debut, the rising star tenor saxophonist piggybacks on ideas postulated on his two prior releases with maturity, freshness, and edge. Most visible to the global public as Terence Blanchard’s tenor man of choice in recent years, Smith convenes an A-list crew of New York’s finest under-40s. Propelling the flow are pianist Jason Moran and drummer Eric Harland (like Smith, both are out of Houston, Texas), triangulated by Milwaukee-born bassist Joe Sanders, while Smith breathes as one on several selections with trumpeter Ambrose Akinmusire, the recent Monk Institute Award winner on his instrument. 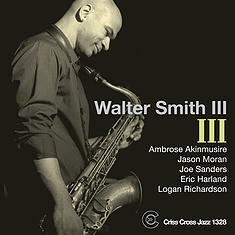 Guest alto saxophonist Logan Richardson plays on Walter Smith III’s composition Himorme .